The Huffy Women Bicyclecomes with a tough steel hard tail frame offering durability, an Enzo 18-speed twist shifter for seamless gear shift, linear pull brakes made from steel, knobby tires, well-padded seats and alloy rims. An eighteen-speed twist shifter from Enzo offering seamless gear transmission. Padded seat with stitched sides offering comfortable ride. The quality of the bike is good also, sporting a well machined steel frame that is sturdy and the Enzo shifters works fine. The seats are well cushioned and for the features, it seems very low priced. It seems a little heavy on the road due to its steel frame but it offers a nice ride nonetheless. 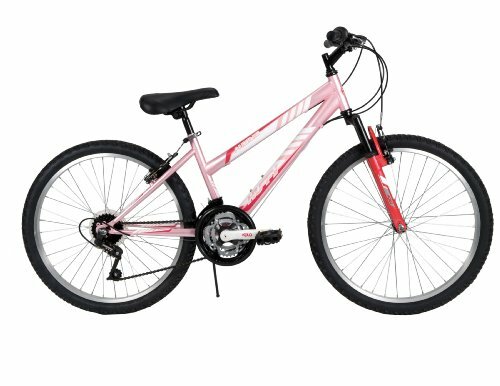 The Huffy Women Bicycle comes highly recommended for its price, nice sweet pink colour scheme, good quality and great handling and overall is an excellent buy.